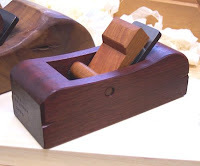 Popular Woodworking Magazine is hosting a woodworking conference this November devoted exclusively to hand tools, called Woodworking in America. The list of speakers i s an all-star line up of hand tool experts and the 3-day weekend will be filled with 40 short classes, a marketplace for toolmakers to display and sell their wares, and social events with demonstrators and toolmakers. Registration begins in June, but I wanted to give you a heads-up on what will most certainly be an awesome weekend.....and I hope, an annual event!